The Little Mermaid (In front of the big pumping station), originally uploaded by Dave Gorman. Is this taken in Vancouver? 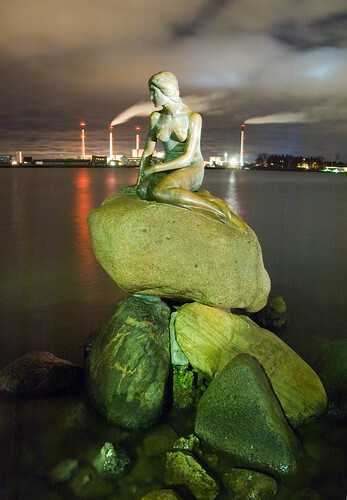 No, this is the Little Mermaid, Copenhagen, Denmark. Very good shot, Dave. Excellent lighting. Good gracious, that's incredible. And so poignant. There is a very similar thing in Vancouver though. It's next to (or perhaps inside) Stanley Park. The statue in Vancouver is (according to wikipedia) actually a statue of a female diver. It's called Girl in a Wetsuit and is by Elek Imredy. The Vancouver authorities weren't able to get permission for a reproduction of the Copenhagen statue and so went with a modern version instead. I've seen a picture of the Vancouver statue. It's quite different. She's wearing a wetsuit for a start - including flippers - and has a facemask propped up on her forehead. Great shot Dave. I don't know if it was just me but didn't you find the statue a bit of a disappointment? We may get to see if she can swim yet! Put me down as someone else who was disappointed. It didn't help that we were walking round for ages trying to find the damn thing.